Create original research content marketing to support brand and drive sales. Shows data to make business case. Includes content marketing tips. 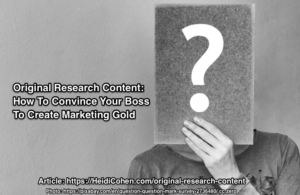 The post Original Research Content: How To Convince Your Boss To Create Marketing Gold appeared first on Heidi Cohen.